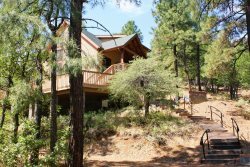 Cottage in the Pines is an elegant, beautifully decorated home just 5 minutes or 1.1 miles from downtown Prescott. This charming property was bought and furnished to be a vacation rental so it’s perfect down to the final touches. This is a three bedroom house that sleeps 6 guests. The master bedroom has a pillowtop king bed and large walk-in closet. Decorated with soothing yellows and blues it is blissful for an afternoon nap or long, comfortable sleep. The full bath has a shower and jetted tub. Two, charming additional bedrooms both have plush queen beds. They share a Jack-and-Jill bathroom with a tub/shower combination. There are ceiling fans in all of the bedrooms and living room. A 42-inch, flat-screen cable TV is located in the sunken living room surrounded by comfy, overstuffed couch and chairs. This space is serene with lovely pictures of flowers and birds above paisley furniture and pillows. The modern kitchen has black counter tops and pendent lighting. It is fully stocked with all pots, pans and dishes and has everything that you need for a simple snack or gourmet meal. There are gleaming, stainless steel appliances including a dishwasher. A stylish, glass dinette seats 4 and looks out to the back patio and yard (where you'll will really want to be.) The relaxing patio has an outdoor sectional seating area and propane grill. Oak and pine trees are abundant and provide plenty of shade for Prescott’s mild seasons. The back yard is fully fenced. There is a separate 2-car garage available for your use. The writing desk in the spacious, airy entryway is a place you can set up a laptop to keep in touch with friends and family or research new places for adventures around Prescott. Cottage in the Pines has a washer/dryer, Internet, and central heating/cooling. There are a few stairs around… so watch your step! Every furnishing, picture, dish and towel was thoughtfully purchased with your comfort in mind. This hidden treasure is the vacation rental of your dreams… book your stay today at Cottage in the Pines!